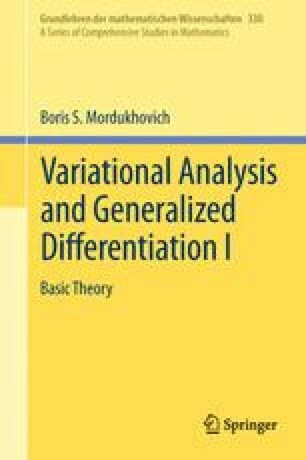 In this chapter we define and study basic concepts of generalized differentiation that lies at the heart of variational analysis and its applications considered in the book. Most properties presented in this chapter hold in arbitrary Banach spaces (some of them don’t require completeness or even a normed structure, as one can see from the proofs). Developing a geometric dual-space approach to generalized differentiation, we start with normals to sets (Sect. 1.1), then proceed to coderivatives of set-valued mappings (Sect. 1.2), and then to subdifferentials of extended-real-valued functions (Sect. 1.3).